Go to original pattern for design DROPS Children 15-6. 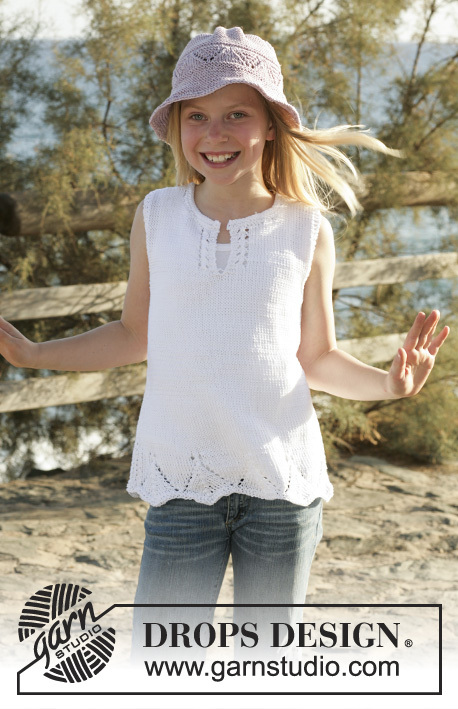 Knitted top and hat with lace pattern, in DROPS Muskat or DROPS Belle. Size children 5 to 14 years. 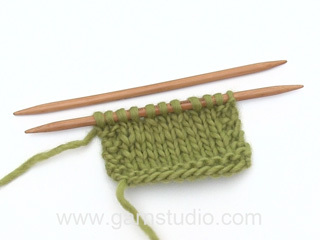 DROPS circular needles size 4.5 mm or the size needed to obtain the correct knitting tension. 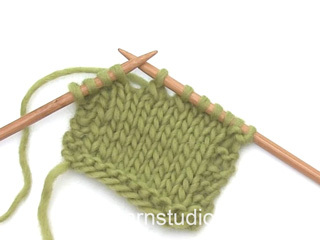 Knitting tension: 20 sts x 26 row on needles size 4.5 mm in stocking sts with Muskat or Belle = 10 x 10 cm. 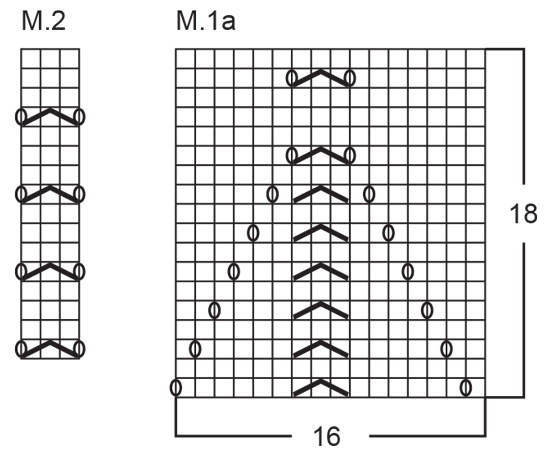 Pattern: See diagrams M.1 and M.2. The diagrams are shown from the RS. 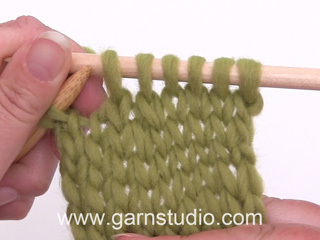 Garter sts back and forth: Knit on all rows. Before 4 garter sts: K2 tog. 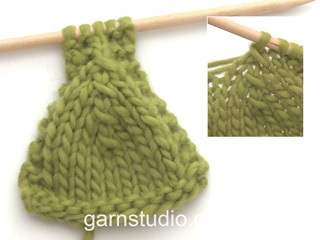 After 4 garter sts: slip a st as if to knit, K1, psso. Knit around. Bend the circular needle double (or use 2 needles) and cast on 144-160-160-176-176 sts using 2 needles with Muskat or Belle(this will make the casting on edge more elastic). Pull out one needle. Insert a marking thread (MT) at the beg. of round and 1 MT after 72-80-80-88-88 sts (= the sides). Knit 4 rounds of garter sts – see explanation above. Continue according to M.1 – see explanation above. When M.1 is completed 1 vertical repeat continue in stocking sts over all sts. At the same time dec. 1 st each side on the MT on every 10-6-15-7-15 cm a total of 2-4-2-4-2 times (= 4 dec. on round) = 136-144-152-160-168 sts. When the piece measures 27-29-31-33-35 cm knit 2 round of garter sts over 14 sts each side (7 sts each side of the MT). On the next round cast off the mid 6 sts for the arm holes each side. Now continue each part separately. Back piece: =62-66-70-74-78 sts. Continue with 4 garter sts towards the armholes. Then dec. 1 sts for the armhole on every other row – read decreasing tips 2-3-4-5-6 times = 58-60-62-64-66 sts. When the piece measures 42-45-48-51-54 cm cast off the mid 26-28-30-32-32 sts for the neck. Continue to cast off 1 st each side of the neck = 15-15-15-15-16 sts left for each shoulder. Cast off when the piece measures 44-47-50-53-56 cm. Front piece: = 62-66-70-74-78 sts. Continue with 4 garter sts towards the arm hole: Cast off for armholes as done for the back piece. At the same time when the piece measures 30-32-34-36-38 cm knit 2 rows of garter sts over thee mid 6 sts (knit other sts as before). On the next row put half of the sts on a thread or a stitch holder and finish each side separately. Side-1: Continue the dec. for the arm holes. Knit 4 garter sts at the side and 3 garter sts towards the slit. Inside the 3 garter sts for the slit knit according to M.2 - see diagram. When the piece measures 39-42-44-47-49 cm put 8-9-10-11-11 sts at the mid front on a thread or a stitch holder for the neck. Then cast off for the neck on every other row as follows: 2 sts 2 times and 1 st 2 times = 15-15-15-15-16 sts left for each shoulder. Cast off when piece measures 44-47-50-53-56 cm. Side -2: Put sts from the thread or stitch holder back on needle. 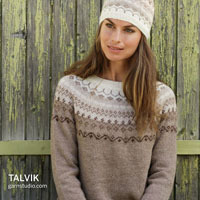 Knit as side-1 but reverse. Assembly: Sew the shoulder seams. Neck edge: Pick up approx. 66-82 sts (incl. the sts from the thread or stitch holder) around the neck on circular needles size 4.5 mm. Knit 4 rows of garter sts back and forth from the mid front. Cast off loosely. Materials: DROPS Muskat from Garnstudio. DROPS needles size 3 mm – or the needle size needed to obtain correct knitting tension. DROPS crochet hook size 3 mm (for crochet edge). Garter sts back and forth: Knit all rows. Knit back and forth on needle. Cast on 133-145 sts loosely (incl 1 edge st each side) on needle size 3 mm with Drops Muskat, knit garter sts. When piece measures 5 cm dec 35-31 sts evenly by K2 tog approx every 3rd -4th sts = 98-114 sts. Continue in garter sts 1 cm, then knit M.1 with 1 edge st each side. After M.1 is knitted 1 time in height continuing in garter sts until piece is completed. Pull 1 thread through remaining sts and sew on well. Sew hat tog mid back in outermost part of outer most sts to make slim and neat seam. 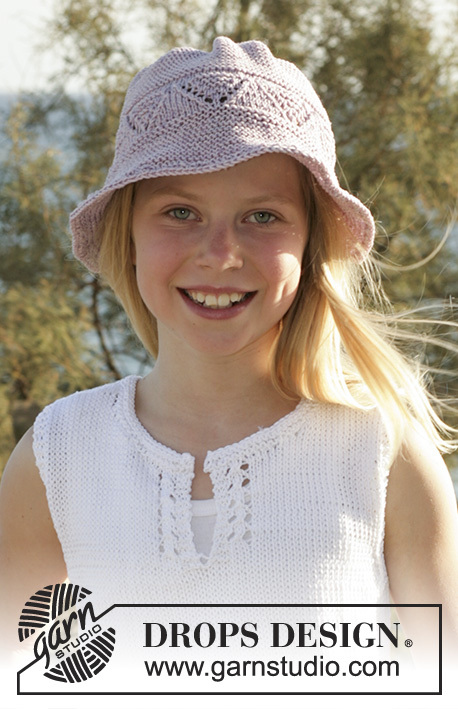 Hat measures approx 19-21 cm in height. Tie 1 thin steel wire along the casting on edge of hat. Crochet 1 round with dc on crochet hook size 3 mm around steel wire + casting on edge, this is done to make hat firm at bottom edge. Bonjour Jacqueline, vous diminuez pour les emmanchures après les 4 premières m point mousse et avant les 4 dernières m point mousse - cf DIMINUTIONS pour les emmanchures. Vous conservez ainsi toujours les 4 m point mousse côté emmanchure pour la bordure d'emmanchure. Bon tricot! When the piece measures 27-29-31-33-35 cm / 10 5/8"-11 3/8"-12 1/4"-13"-13 3/4" work 2 round of garter sts over 14 sts each side (7 sts each side of the marker) and rem sts as before. On the next round bind off the mid 6 sts for the arm holes each side. Now continue each part separately. I'm confused on these instructions. Do I only work the next 14 stitches? Dear Sarah, you've to work the 14 sts each side in garter sts and work the other sts as before. Happy knitting!! Ich stricke in der Größe 134/140, habe M1 einmal in der Höhe und auch die Abnahmen direkt danach gestrickt. Jetzt befinden sich 156 Maschen auf meiner Nadel. Wo bzw wann werden die nächsten Abnahmen gemacht? In der Anleitung steht ja alle 15 cm - 2 mal. Wenn ich von jetzt aus messe, wird das Oberteil ja viel länger als angegeben. Kann es sein, dass von der Anschlagskante gemessen wird? 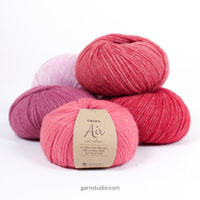 Liebe Ann-Christine, die erste Abnahme wird nach 15 cm gestrickt und die 2. Abnahme nach insgesamt 30 cm (= 15 cm nach der 1. Abnahme). Sie nehmen jeweils 4 Maschen ab (= 1 M vor und 1 M nach jeder beiden Markierung): 160- (4 M x 2) = 152 M. Viel Spaß beim stricken! Buongiorno Alex. Per lo scollo, deve iniziare a chiudere le maglie quando il ferro inizia dallo scollo. Quindi, per la parte destra (quando il capo è indossato) chiude le maglie sul diritto del lavoro; per la sinistra sul rovescio. Non ci deve essere distanza tra le maglie. Buon lavoro! Buonasera Mara. Le diminuzioni vengono fatte un ferro sì (sul diritto del lavoro) e un ferro no (rovescio). Quindi diminuisce la prima volta sul diritto del lavoro e anche le diminuzioni successive saranno sul diritto. Buon lavoro! Bonjour, c'est la première fois que je vais tricoté avec des aiguille circulaire et je ne comprend pas cette phrase : Plier l’aiguille circulaire en 2 (ou utiliser 2 aiguilles) merci de votre aide. Bonjour Émilie, la vidéo ci-dessous montre comment monter les mailles sur 2 aiguilles droites, pour faire cette technique sur aiguille circulaire, utilisez les 2 pointes de l'aiguille circulaire et retirez délicatement une des pointes quand les mailles sont montées. Bon tricot! Buongiorno Alex. Può chiudere una maglia come la chiude normalmente a fine lavoro oppure può lavorare 2 maglie insieme a diritto. Buon lavoro!